The Far 3 kpc Arm was discovered in 2008 by astronomer Tom Dame (Harvard-Smithsonian CfA), while preparing a talk on the Galaxy's spiral arms for a meeting of the 212th American Astronomical Society. 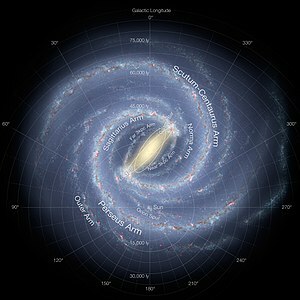 It is one of Milky Way's spiral arms and it is located in the first galactic quadrant at a distance of 3 kpc (about 10,000 ly) from the galactic center. Along with the Near 3 kpc Arm whose existence is known since the mid-1950s, the counterpart inner arms establish our Galaxy's simple symmetry. Tom Dame and collaborator Patrick Thaddeus analyzed data obtained using a 1.2-meter-diameter millimeter-wave telescope located at Cerro Tololo Inter-American Observatory (CTIO) in Chile. They detected the presence of the spiral arm in a CO survey and later confirmed their discovery using 21-centimeter radio measurements of atomic hydrogen collected by colleagues in Australia. This article uses material from the Wikipedia article "Far 3 kpc Arm", which is released under the Creative Commons Attribution-Share-Alike License 3.0.